When I interviewed at Utah State back in October, it seemed like things had gone pretty well, and I was kind of confident I’d get a job offer. So I figured I could be done interviewing and, relatedly, done having to shave. This launched me on a magical journey in which I continued to not shave (or use a trimmer) for the next six months. So here’s an FAQ for some reason. Do people respond to you differently? Yes. Very frequently, I’ll be walking somewhere and notice someone staring at me, and I’ll think do I know that person or something? and then a couple seconds later remember oh, right, I have this beard now. Any time I pass another guy with a long-ish beard, there’s a sort-of acknowledgement that occurs between us. I also find that non-white people and alt-girls are far friendlier. People I’ve never met before comment on it with some frequency. 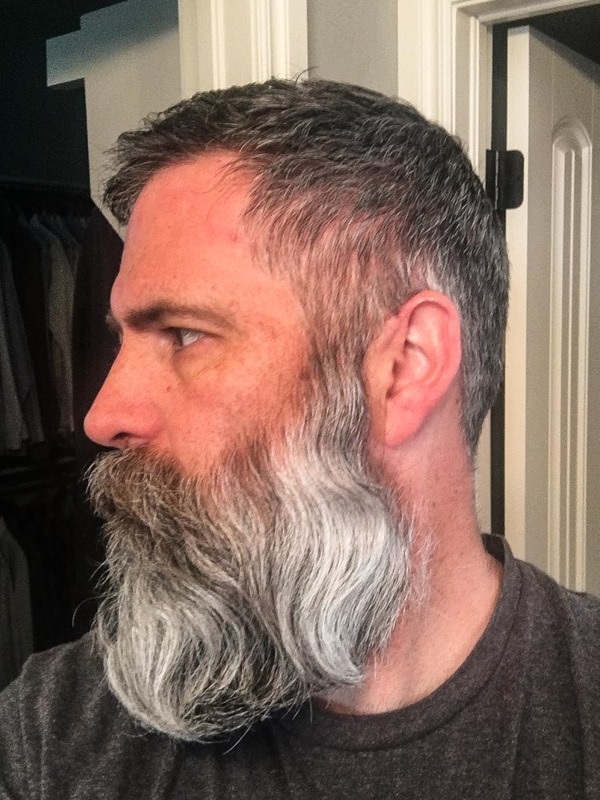 How much longer will you grow it out? Since the photo above (and since the six-month point), I’ve had the barber trim back the moustache and tidy up the rest a little, so it’s not like I’m on some purist run of unfettered beard development. Also, let’s be honest, I’ll probably feel compelled to trim it back to human proportions before I start the new job in August. They’ll want to be taking head-shots for the website, etc. Also, to be honest, I think it looked best at about the four-month mark. So: a while, but not forever. Do you use beard oil? Yes, and beard conditioner and beard balm (wax). That part makes the endeavor seem a little less masculine. Conditioner in the shower a couple times a week, wash it about once a week, oil it twice a day, then the balm usually in the morning. If it seems like it’s going to be a little too curly otherwise on a given day, I’ll also blow dry it and try to brush out the curls. What does it feel like? Is it hot? Like hair growing out of my face, although there was a two-month stage in there when it was more like having a stuffed animal attached to my face. Haven’t dealt with any super-hot or super-humid days on this go-round, but we had temps in the 80s and pretty-high humidity earlier this month, and I don’t know that I could tell the difference. It probably ought to act like some sort of heat sink/insulation though. I’ve had facial hair in the past, I really don’t think it has much of an impact. Doesn’t seem to keep me warmer in the cold, either (particularly when the whole thing gets frozen down to my skin). Did you know you look like [name of person with beard]? It gets a little old having people tell me I remind them of some famous dude with a beard. It’s not a super insightful comment and usually doesn’t seem all that, you know, accurate. I mean, telling me I look like Grizzly Adams because we both have beards is kind of like me telling someone that they look like Hitler because they both have ears. And as we all know Dan Haggerty basically = Hitler. Did you know it makes you look even older than you actually are? You’re crazy. OTOH, this is kind of what a grown-out 45-year-old white dude’s beard looks like. If you didn’t already know that, that’s on you. Are you trying to be a hipster? I guess not, but maybe? The “beard culture” of the hipsters is a little unappealing to me. If you ever read any of the marketing copy (or the clearly paid-for Amazon reviews) of the various beard care products, you’ll notice they’re really cloying, similar to the eye roll-inducing word choices dog people use to talk about dogs nowadays (“look how cute my pupper baby doggo is!”, etc.). I imagine that’s an attempt to appeal to the bearded hipster audience. Anyway, I’d prefer to think that it’s just a beard and not a semi-ironic statement of oneness with hirsute millennials, but OTOH I get along pretty well with millennials, so there’s also that to consider. How do you get those curls in it? It happens naturally. The greater struggle is to keep the curls from becoming overwhelming. Did you grow it because you’re moving to the mountains? Those mountains are in Utah, which is a socially conservative place (and therefore not particularly beard- or even outlier-friendly). I mean, maybe I’m growing it as a bulwark against future interactions with pharisaical Utah Mormons, but — you know. I’m not going to the land of mountain men, in full brawny man costume with old-time fur trappers. It’s maybe a better symbol of being from western Washington originally than anything. First off, why not? I mean, seriously. Secondly, because I’ve always sort of wanted to and now lined up as a good-enough time for it. And thirdly, it kind of seems like a more honest portrayal of myself for first-time meeters. Aside from income, height, BMI, and blood type, I’m in the 1 (or 2) percent on just about any scale you can name; I think the beard probably does a better job of conveying this than would my face looking like everyone else’s. You’re welcome, current strangers. What’s the worst part of having it? Three candidates: (1) not being able to eat sandwiches without getting hair between my teeth (but one that’s much lessened now that the moustache has been trimmed back); (2) (relatedly) stray hairs from the moustache tickling my nose and waking me up in the middle of the night; or (3) especially between months four and five, stiff-collared dress shirts were a hassle and tended to mess it up. I suppose occasionally having to blow-dry my face should probably also rank up there somewhere. What’s the best part of having it? Writing FAQs about it? I dunno. It’s an interesting experience to occasionally pass a mirror and think, woah, I look like *that*? That’s probably the best part.